I travelled to Joplin, MO the morning after the EF-5 tornado destroyed an estimated 30% of the large southwestern Missouri town. Monday was a dreary rainy day and I decided to ditch my car and walk through what was now the largely destroyed southern part of Joplin. I only had a few hours on the ground before I had to try and file some photographs but as I walked and talked with folks it was absolutely clear to me that you could not capture the size of the destruction in one single frame from a 35mm digital camera. So I decided I needed to do something a little different than I normally would do. Over the next week, I would come back a few days and do strictly panoramic photographs of the city. To me, this was the best way to fully capture the scale of the devastation and the flattened look of the city. I had never tried to make a panoramic photograph so I had a little learning to do before I came back. As always, it is impossible to fully capture the true feeling of most disaster scenes without someone actually taking it in, with all their senses, by themselves. That was and is true for this Joplin tornado. The destruction is enormous. Homes have been turned to splinters. Cars have been tossed all around. Trees have been stripped of bark and limbs. The landscape looks nothing like it once did. The loss of life is enormous. This tornado is the most deadly in many many decades. However, looking out across the swaths of this leveled city it is hard to fathom how more people were not killed. Hearing people recount their stories of riding out the tornado in their bathtub knowing they were moments from death still brings me chills. These photographs are part of the new history of the city of Joplin. I have shot around 30 panoramic photographs in Joplin. While doing these photographs, I also did a few panoramic “portraits” of storm survivors and recorded the audio of them recounting their stories of the storm and where they go from here. I will be putting that together in the next few weeks as I have time. Each panoramic photograph was stitched together from a collection of vertical photographs I made at each scene. Some were shot on a tripod some were handheld. I “stitched” them together in an automated program in Adobe Photoshop CS5. I plan on returning back to Joplin every month or two to try and shoot from the same places to document what happens to this city and the people there. 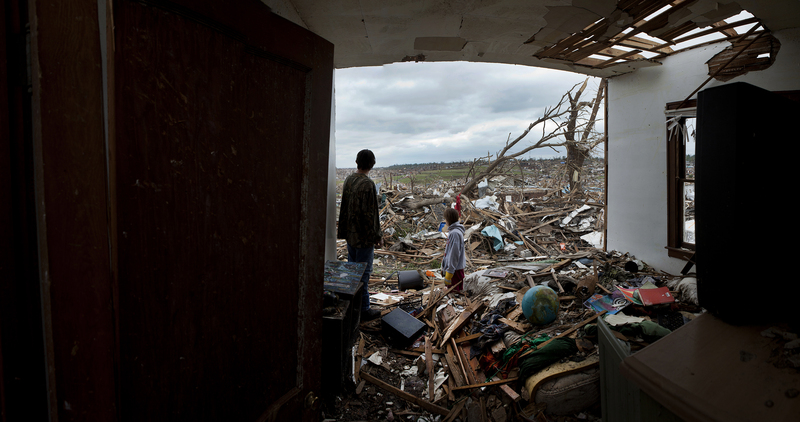 I hope those future panoramic’s will show Joplin raising out of the destruction to something better than it was before. Here are a few frames.